Lexington, Ky.---- November 9, 2018 -----The U.S. Hunter Jumper Association has expanded the USHJA Emerging Jumper Rider Program to offer two new facets---- a 1.40/1.45m Platinum Show Jumping Championship with team and individual competition, as well as a USHJA Show Jumping Rider Ranking List that recognizes top Jumper riders competing at the 1.35-1.45m level. In the past, riders at the 1.40-1.45m level have had numerous classes from which to choose, but they never had something specifically designed to advance them to the next level. Beginning in 2019, the USHJA Emerging Jumper Rider program will offer both recognition and an opportunity to showcase a rider's skills at this level. "We're excited to launch the next phase of the USHJA Emerging Jumper Rider Program and bring new opportunities and recognition to the 1.40/1.45m Jumper riders in the U.S.," said Larry Langer, chair of the USHJA Emerging Jumper Rider Program. "With the addition of the USHJA Rider Ranking List, the Platinum Championships and Platinum Master Training Session, on top of the USHJA Zone Jumper Team Championships and Gold Star Clinics, there has never been a clearer pathway for Jumper riders to set goals and achieve success in the sport." The Platinum Jumper Championships (1.40-1.45m) are open to Professionals, Juniors and Amateurs. The Platinum Championships will offer team and individual competition and an opportunity to qualify for a USHJA Platinum Masters Training Session with top international industry experts. The Platinum Championships are held as overlay classes with special 1.40/1.45m open classes and grand prix classes held at the American Standard offered during the same competition hosting the USHJA Zone Jumper Team Championships. To be eligible to qualify for the Championships athlete/horse combinations must declare and complete an application at least 45 days before their zone's Platinum Jumper Championships and have earned a minimum of $250 in applicable sections. 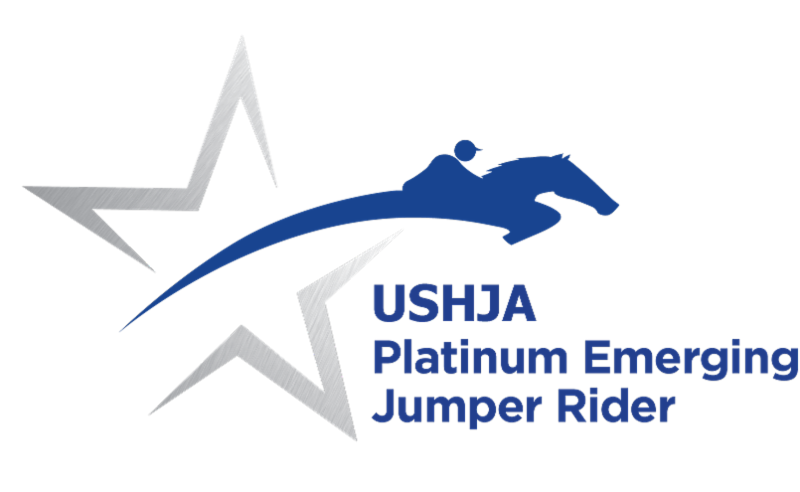 Individual medalists from the Platinum Championships and select Wild Cards will be designated as USHJA Show Jumping Platinum Athletes and will be invited to the Platinum Masters Training Session. During the Training Session, athletes will participate in advanced workshops and training sessions with top national and international clinicians and industry specialists. The USHJA Show Jumping Rider Ranking List provides the top Emerging Jumper Riders with recognition for their achievements in a National master ranking list, which also will be organized into three regions: East (Zones 1, 2, 3, and 4), Central (Zones 5, 6, 7, and 8), and West (Zones 9, 10, 11, and 12). USHJA will update the ranking list weekly and promote it. This list is separate from the Rolex/USEF Show Jumping Ranking List, though similar in concept. Riders earn points by earning money in specific grand prix or special classes at competitions that have applied to the USHJA to have their classes count toward the USHJA Rider Ranking List. Accepted classes are organized into two levels with one-half point per dollar earned in Level 1 classes and 1 point per dollar earned in Level 2 classes. Points may be earned in participating classes anywhere in the United States. The U.S. Show Jumping Athlete Pathway is a joint effort of the USHJA and US Equestrian. The USHJA is squarely focused on the national advancement of Jumper riders at the 1.10m to 1.45m level, while US Equestrian develops athletes competing in international competitions at all levels and national competitions above 1.45m. This division of focus allows each organization to create comprehensive opportunities that serve members at all levels and in turn the future of the sport at the international level. For more information about the Platinum Jumper Championships, click here. For more information about the USHJA Show Jumping Rider Ranking List, click here.